The Reformation restored the Scriptures to the people, but the job was only halfway finished. Today the church is awakening to the truth that ministry is not just the domain of clergy, but belongs to the entire body of Christ. God is moving her to complete her unfinished business of placing the ministry back in the hands of the people. 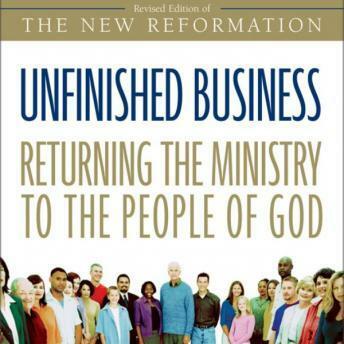 Unfinished Business has played a pivotal part in helping the church reclaim ministry at the grassroots level. First published in 1990 as The New Reformation, it has become a classic resource for church life. Expanding on and updating the original material with fresh examples and references to eight key important movements, this new edition lays foundations for the church to move from: - Passive to active - Maintenance to mission - Clergy to people of God - Teacher/caregiver to equipping enabler Pointing us back to the church as an organism, not an institution, author Greg Ogden shows how each of us is called to help finish the Reformation's unfinished business: expressing the priesthood of every believer practically in the church, the world, and all avenues of life.